2. Department of Surgical Oncology, Kalinga Institute of Medical sciences, Bhubaneswar, Odisha-751024, India. 4. Department of Pathology, Apollo Hospitals, Bhubaneswar, Odisha-751004, India. Background: Tumorigenesis is a complex process of accumulated alteration in function of multiple genes and pathways. Wnt signalling pathway is involved in various differentiation events during embryonic development and is conserved in various species. Objective: A multicentre collaborative initiative is undertaken to study the occurrence, prognosis and molecular mechanism of HNSCC (Head and Neck Squamous Cell Carcinoma) which is highly prevalent in eastern parts of India. From a large cohort of HNSCC tissue repository, 67 cases were selected for multi-parametric investigation. Results: 67 cases showed stable β-catenin expression. We have seen correlation, if any, of the transcription factor - β-catenin, telomere maintenance and shelterin complex proteins - TRF2, Rap1 and hTert with respect to tumor differentiation and telomere dysfunction. 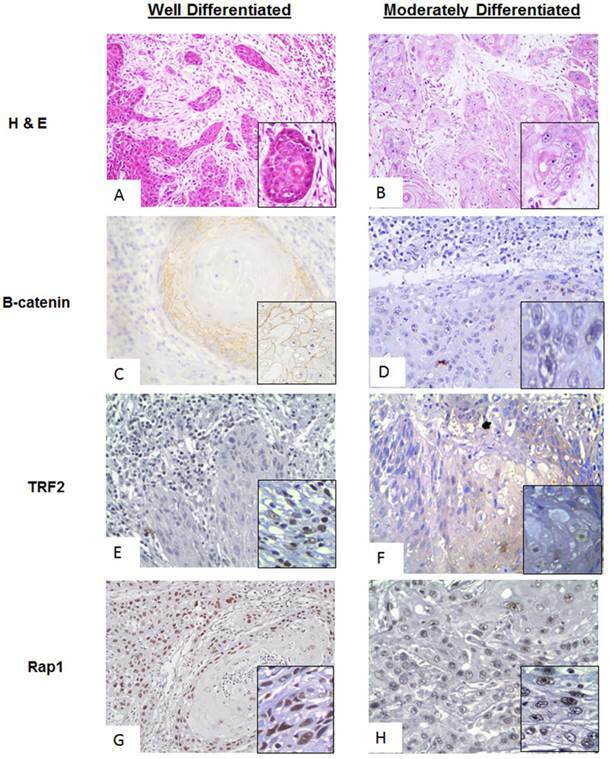 Immunohistochemistry of β-catenin protein showed stable and high expression in tumor when compared to stroma. MDSCC (Moderately Differentiated Squamous cell carcinoma) cases expressed nuclear expression of β-catenin in invasive fronts and showed increased genomic instability. Higher frequency of Anaphase bridges was observed ranging from <3% in normal cut margin to 13% in WDSCC (Well differentiated squamous cell carcinoma) and 18% in MDSCC (Moderately differentiated Squamous cell carcinoma). There was significant decrease in telomere length in MDSCC (<4) when compared to the normal cut margin samples (<7). Quantitative Real Time-PCR confirmed a significant correlationship between stable β-catenin expression and poor clinical and pathological outcome. Conclusion: The Stabilisation and accumulation of β-catenin was significant and correlated well with de-differentiation process as well as prognosis and therapy outcome of the patients in the cohort. Expression status of molecular markers such as β-catenin, hTert, TRF2 and RAP1 correlate significantly with the process of tumorigenesis and prognosis and may play a role in therapeutic management of Head and neck patients. Keywords: HNSCC, Genomic instability, Wnt/β-catenin, Dedifferentiation, MDSCC, WDSCC. With more than 500,000 new cases diagnosed each year, Head and Neck Squamous Cell Carcinoma (HNSCC) ranks among the 10 most common cancers worldwide. India, compared to the developed countries, has a higher rate of incidents due to the habits of tobacco chewing and smoking. [1-4] The reason for limited survival of the HNSCC patients is the higher number of patients presented at an advanced disease stage, lack of suitable marker for early detection and failure to efficiently respond to the chemotherapy and minimal residual disease (MRD). [2, 5, 7] Thus to target HNSCC efficiently, improvement on conventional therapy is urgently required. The Wnt signalling pathway is involved in various differentiation events during embryonic development and is conserved in various species. It leads to tumor formation when activated aberrantly. [8, 9] In the absence of signalling molecule (Wnt), free cytoplasmic β-catenin gets phosphorylated in the axin (destruction) complex leading to ubiquitination and degradation in the cytoplasm. [8, 10] As Wnt binds to the cell surface receptors, β-catenin escapes the degradation complex of axin, stabilizes and accumulates in the cytoplasm and translocates to the nucleus, where it binds with the transcription factors. viz., T cell factor (TCF)/lymphoid enhancer factor (Lef), leading to the upregulation of the wnt targeted genes. [11,12] Evidence till date reveals that the genes that are helpful in occurrence and development of cancer are the targets of the Wnt/β-catenin pathway and are usually upregulated as a consequence of the deregulation of the signalling molecules. 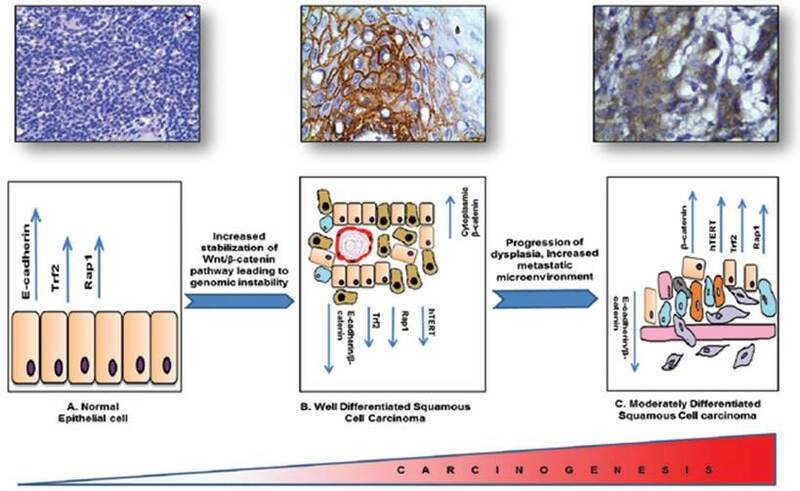 Thus wnt/ β-catenin play a crucial role in determining the process of carcinogenesis. Telomere (protective end of chromosomes) determines genome integrity. [16, 17] Specific group of hexaproteins called shelterin (TRF1, TRF2, Rap1, TIN2, POT1, and TPP1) with additional specific non-telomeric protein plays a vital role in cellular DNA damage response by protecting, regulating the telomere and maintaining the integrity of the genome. [14, 15] Telomere dysfunction leads to perturbation in various cell signalling pathways including the Wnt/β-catenin pathway. [13, 19] Telomere attrition signals the DNA damaging sensors triggering the onset of genomic instability. A common indicator and cause of chromosome instability is the formation of anaphase-bridge, where chromosomes are pulled towards both the poles of the centriole during segregation. These bridges then break due to mitotic stress and again form in the next interphase, giving rise to breakage-fusion-bridge cycles. DNA damage induces double stranded breaks (DSBs) which are difficult to repair, however they typically fuse back together to restore chromosomal structure. This misligation of two non-matching ends may result in the formation of Anaphase- Bridge and chromosomal instability. The consequential genomic instability is associated with aggressiveness and poor prognosis of the disease. In carcinoma, increased aggression is related to increase in the gradation of dysplasia resulting in poor prognosis. So it becomes important to study the underlying mechanism of telomere dysfunction with the aggressiveness of tumors. Telomerase is a known regulator of telomere maintenance and several cofactors positively and negatively regulates the transcription of telomerase gene. [26, 16] Previously it has been reported, that hTert is an indirect transcriptional target of β-catenin of the Wnt developmental pathway. [26, 28] hTert, being the key player and specific to cancer cells, is also regulated by Wnt/β-catenin in those cells. Recently it has been shown that hTert serves as a cofactor for the β-catenin transcriptional complex and hence plays a significant role in Wnt/β-catenin pathway. Mutations in β-catenin results in upregulation of hTert expression facilitating stabilization of the telomeres thus providing a significant hall mark for tumorigenesis. The dynamics of β-catenin and telomere regulation is not completely clear. In order to study the correlation if any in between these two pathways we designed a multi parametric molecular pathological approach to relate observational findings of the protein expression and molecular changes. 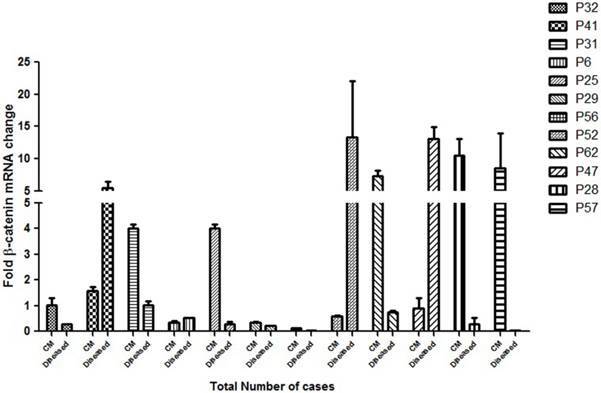 In the present study, 67 HNSCC cases were selected from a library of large tissue repository with clinical information and analysed for stable β-catenin expression and then categorised according to their histopathological grading. Only those tissues which had stable β-catenin expression and complete clinical and prognostic information were selected. The differentiation grades were characterised as lower grade (n=4), well differentiated (n=29) and moderately differentiated (n=34) squamous cell carcinoma. Grade specific analysis was done for stable β-catenin in stromal and tumor areas in the histopathological sections. 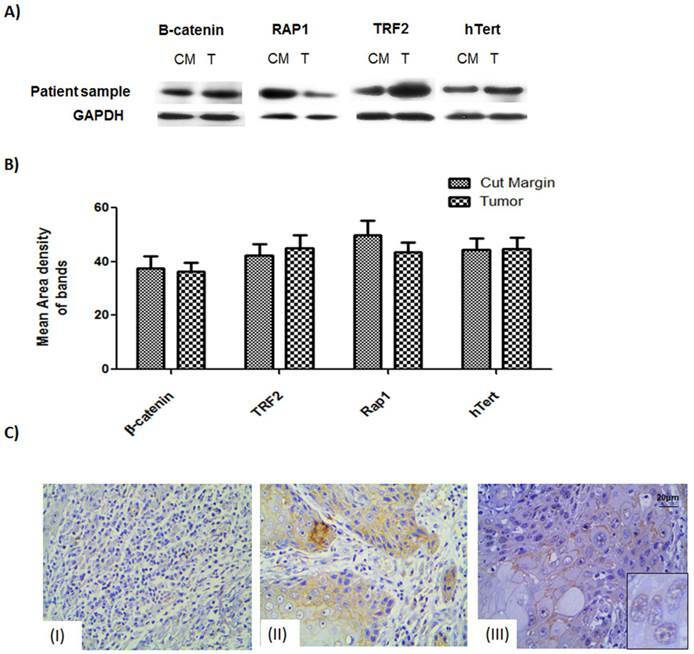 Three important telomere maintenance proteins (TRF2, Rap1 and hTert) were also studied by immunohistochemistry and correlated with β-catenin. Patients with poor prognosis (n=10) and higher correlationship of β-catenin and shelterin proteins were further investigated for genome instability by telomere length analysis (Quantitative fluorescent insitu hybridisation) and Anaphase bridges. Q-PCR analysis was done for the randomly selected 12 cases and repeated three times to check the correlationship between the β-catenin expression level and the clinical outcome of the patient. Flow chart showing the experimental methodology and study design. Human tissue samples from patients with Head and Neck squamous cell carcinoma were acquired at the time of surgical removal of the tumor tissue across the cut margin area. Cut margin tissues were collected as normal counterparts of an individual case. Tissues were collected in Protease Inhibitor Cocktail solution and 4% Formaldehyde for whole tissue lysate preparation for Western blot analysis and tissue processing for the immunohistochemistry respectively. The samples were kept at 15-25ºC overnight and then stored at -80ºC storage. Voluntary consent form was duly signed from the patient or their nominees. The human sample collection was followed strictly as per institutional ethical board guidelines. The study was approved by institutional ethics committee. Immunohistochemistry analysis was done for HNSCC tissue sections taken over poly-L-lysine coated slides. The tissue sections were taken from formalin fixed, paraffin embedded blocks. [28, 33] Immunostaining was done by the use of Biogenex Super Sensitive TM Polymer-HRP IHC Detection system (REF: QD400-60KE). Antigen retrieval was done by the use of microwave method in 10mM Sodium citrate buffer pH 6.0 for 20 minutes. The sections were then blocked with 3% BSA in TBST for 2hrs at RT and then probed with primary antibody (1:2000) for 1hr at RT or at 4°C overnight. Peroxide block was performed for 15 minutes in dark at RT to avoid the non-specific signals. Sections were washed and then incubated with the secondary antibody (1:4000) conjugated with HRP for 90 minutes at RT followed by washing and treatment with DAB chromogen for 5 minutes at RT. Sections were washed and counterstained with haematoxylin. [33, 34] Imaging of the stained slides was done using Leica (DM 2000) bright-field microscopy. Analysis of the frequency of anaphase bridges is commonly considered as an indicator of chromosomal instability. The tissue sections were taken from formalin fixed, paraffin embedded blocks. [35, 34] The sections were then stained with Haematoxylin and Eosin. Anaphase bridges were counted per thousand dividing cells both for tumor and the cut margin sections. Paraffin embedded tissue sections of 3-4μm thickness were deparaffinised in 100% Xylene followed by dehydration in 100% ethanol, and subsequent incubation in 1 M sodium thiocyanate at 80ºC for 8 min. Slides were then incubated in 1% pepsin. The tissue sections were then hybridized with Cy3 conjugated PNA telomere probe. Stringent washes were performed and the slides were counterstained with DAPI. Images were captured with Zeiss Axioplan 2 imaging microscope (Carl Zeiss, Gottingen, Germany) and the telomere signals were quantitated using the ISIS software (Metasystems, Altusseheim, Germany). The fluorescent intensity was calculated as arbitrary fluorescent intensity the software. Total RNA was extracted from the frozen stored tissues with TRIsure reagent (BIOLINE) in accordance with the manufacturer's instructions reverse transcription was performed in total volume of 20µl using 2µg of total RNA by TETRO cDNA synthesis kit (BIOLINE). Real time PCR was carried out on the CFX ConnectTM (BIORAD) for β-catenin using KAPA SYBR® FAST qPCR Kit Master Mix (2x) Universal (KapaBiosysytems). β-actin was used as the housekeeping gene. β-catenin PCR primers are designed based on human β-catenin mRNA sequence. The primer sequences are as follows: Forward 5'-GCTTTCAGTTGAGCTGACCA-3' and reverse 5'- CAAGTCCAAGATCAGCAGTCTC-3'. As an internal control, a fragment of human β-actin was amplified using the following primers: Forward 5'-TCACCCACACTGTGCCCATCTACGA-3' and reverse 5'-CAGCGGAACCGCTCATTGCCAATGG-3'. PCR conditions were set as per manufacturer's instruction. Quantification was performed using the 2ΔΔCT method. The absolute levels of β -catenin mRNA were normalized to that of β-actin mRNA. The HNSCC tissues as well as their respective cut margins were compared with the lower grade leukoplakia case to check the status of differentially expressed β -catenin gene in each case. The results obtained from western blotting were quantified using the VisionWorksLSTM software and the net upregulation and downregulation of each of the 5 antibodies for 67 (33 all 5, additional 34 β-catenin) cases were recorded. Also grade specific percentage upregulation and downregulation for each of the 5 antibodies were recorded and a comparative graph was plotted using GraphPad PrismTM. The histopathological Analysis for the considered cases was verified by two independent pathologists in a double blinded method. Any kind of discrepancy in analysis was resolved by a third independent pathologist. All the margins that were considered were not free of tumor. Infiltrations were verified by two independent pathologists. More than 1000 tumor cells were analysed per sample to decrease the experimental error. Expression levels of the proteins of interest, viz., β-catenin, TRF2, hTERT and Rap1, were studied for 67 tumor samples which showed stable β-catenin. The western data showed that not only the tumor samples but also the cut margin showed stable expression of β-catenin Figure 1A. Data obtained from quantitative analysis of western results were plotted and it was found to confirm the above observation of net stabilization for all the proteins under consideration in the tumor as well as their cut margin areas shown in Figure 1B. IHC of β-catenin showed section specific marked stabilization of the signals Figure 1C. Non-infiltrated regions showed no signal of tumorigenic β-catenin Figure 1C (I). Regions having infiltrated tumor cells had membranous. β-catenin expression Figure 1C (II) Regions of the tumor having moderately differentiated/poorly differentiated cells showing nuclear localization of the β-catenin as can be seen in the inset. Figure 1C (III). 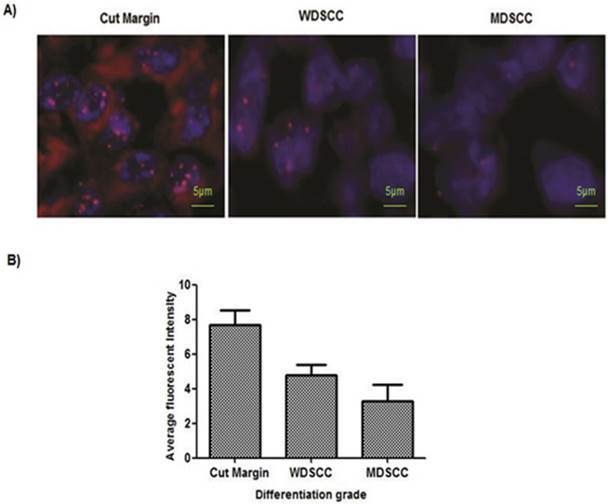 A comparative analysis of the proteins of interest in WDSCC (Well differentiated squamous cell carcinoma) and MDSCC (Moderately Differentiated Squamous cell carcinoma) was performed by Immunohistochemistry. It was found differential expression in the proteins of interest (β-catenin, TRF2 and Rap1,) was seen in MDSCC cases with respect to WDSCC and was quantified using ImmunoratioTM software. The comparative observation of WDSCC and MDSCC is shown in Figure 2. Figure 2A and 2B showing the Haematoxylin and eosin (H& E) stain of both well differentiated and moderately differentiated regions respectively. Figure 2C and 2D showing stable membranous expression of β-catenin in tumors of WDSCC and a nuclear translocation (inset) in tumors of MDSCC respectively. Stable TRF2 expression was observed in WDSCC and a cytoplasmic translocation was observed in MDSCC regions as shown in figure 2E and 2F (inset) respectively. Expression of Rap1 was observed to be strongly and stably localised in the nucleus both in WDSCC and MDSCC (figure 2G and figure 2F). The expression level of proteins β-catenin, hTert, Rap1 and TRF2 probed by respective antibodies in western blotting. (A) Western blot analysis shows expression level of the β-catenin, TRF2, Rap1 and hTert in human samples in compared with GAPDH as loading controls. (B) Graphical representation of increased protein levels of β-catenin, hTert, Rap1 and TRF2 in 33 patient sample cohort which was found to be stable in tumor tissue as well as their cut margin irrespective of their differentiation criteria of categorization analysed by VisionWorksLSTM. Error bars represent SE. (C) Immunohistochemistry validation of β-catenin showed section specific marked stabilization of the signals. (I) Non-infiltrated regions showed no signal of tumorigenic β-catenin. (II) Regions showing infiltrated tumor cells having membranous β-catenin expression. (III) Regions tumor showing nuclear localization of the β-catenin as can be seen in the inset. A comparative analysis of β-catenin, TRF2, Rap1 expression in WDSCC and MDSCC by Immunohistochemistry. (A) Image representing the Haematoxylin and Eosin (H& E) stain in well differentiated region. (B) Image representing the Haematoxylin and Eosin (H& E) stain in moderately differentiated regions. (C) Image representing stable membranous expression of β-catenin in WDSCC. (D) Image representing a nuclear translocation (inset) of β-catenin in MDSCC. (E) Image representing stable TRF2 expression in WDSCC. (F) Image representing a cytoplasmic translocation of TRF2 in MDSCC regions. (G) Image showing stable expression of Rap1 in the nucleus in WDSCC. (H) Image showing equally stable expression of Rap1 in the nucleus in MDSCC. Paired adjacent tissues were observed to have longer telomeres than in the HNSCC tumor tissue. To gain further insights into the telomere length changes, we have used in situ analysis of telomere length by quantitative-fluorescence in situ hybridization on paraffin tissue. Quantitative-fluorescence in situ hybridization analysis yielded similar reductions in telomere lengths in tumor tissues compared with the adjacent tissues. The reduction of telomere length in early or premalignant stages is also associated with genome instability. MDSCC/Poorly differentiated cells showed shortening of telomeres. (Figure 4A, 4B). To assess the clinical implication of β-catenin mRNA expression in HNSCC cases, the expression of this gene was analysed by real time quantitative PCR. A significant correlationship of the expression status of β-catenin in the cut margin and the tumor sample with their respective clinical prognosis was observed as shown in Figure 5. Almost all the samples had background expression of β-catenin in the cut margin regions and P31, P25, P29, P62, P28, P56 and P57 showed an upregulation of the β-catenin gene in the cut margins compared to its tumor tissues which also correlates with a bad prognosis of the respective patients. This confirms the infilteration of the β-catenin positive aggressive cells in the cut margin area. Incidence of anaphase bridges as an indicator of telomere dysfunction was found to be higher in higher grades of HNSCC. (A) Average frequency of anaphase bridge formation in all the grades of tumors. ***P<0.0001. (B) Anaphase bridges in Haematoxylin and eosin (H&E) stained tumor paraffin sections. PNA-FISH revealed reduced telomere length in higher grades of tumor tissue sample. (A) Telomere length measured on paraffin tissue sections by PNA FISH. Normal sections showed 7.7 as an average fluorescent intensity, WDSCC sections showed 4.8 fluorescent intensity, and MDSCC sections showed 3.3 fluorescent intensity as telomere length on an average when compared with the paired adjacent tissues. Bars indicate SE. (B) Representative pictures of tissue FISH in the paraffin sections of Normal, WDSCC and MDSCC tumors showing telomere signals using the telomere specific Cy-3 labelled PNA probe. *P<0.05. The fluorescent intensity was calculated as arbitrary fluorescent intensity by Zeiss ISIS software. qPCR analysis of the β-catenin gene expression as a factor of fold change in mRNA for cut margin (CM) and diseased tissues of 12 randomly chosen HNSCC cases are shown. P32 belonged to lower grade leukoplakia against which the expressions of the rest of the cases were compared. Upregulation of β-catenin in the cut margin region was observed in cases P31, P25, P29, P56, P62, P28 and P57 as compared to their respective counterparts which is suggestive of diseased cells infiltration expressing β-catenin into the cut margin area. Mutations in the wnt signalling pathway leads to alterations in the β-catenin level in the cells. Altered/reduced β-catenin expression has been correlated with the higher histological grade, poor prognosis, aggressive phenotype, invasion and metastasis. Loss of β-catenin protein at the membrane thus leads to reduced intercellular adhesion associated with the loss of differentiation and acquisition of an invasive phenotype in a range of tumor. [37,38] Genomic Instability is known to play key role in therapy outcomes in solid tumors as it is crucial in the process of carcinogenesis. 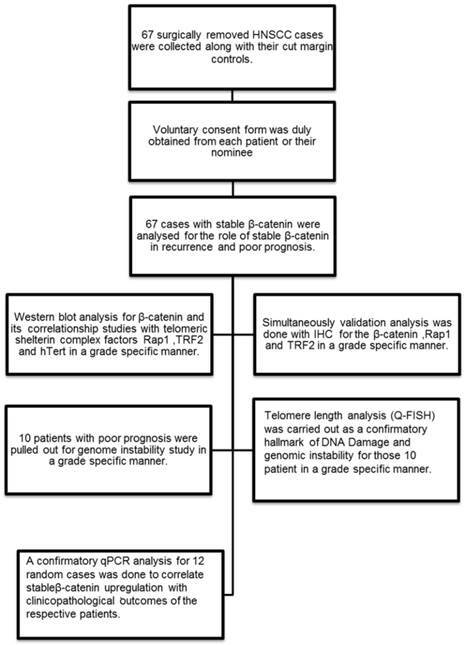 In this study an attempt has been made to find observational correlation if there is any in between β-catenin, hTert and telomere group of proteins with respect to the grade specific differentiation, along with the variation in genomic instability in a cohort of 67 patients selected from our library of large tissue repository on the basis of stable beta catenin expression both in the tumor and their cut margin counterpart. Cases with stable β-catenin were selected for its major role in tumorigenesis as can be seen from our IHC data Figure 1. Previous studies have shown that upregulation of the Wnt/β-catenin signalling leads to upregulation of TRF2 level, key player of the shelterin complex, resulting in enhanced telomere protection. Simultaneously, β-catenin, escapes degradation on the activation of the Wnt signal on the cells promoting the expression of hTert in embryonic stem (ES) cells and cancer cells. The wnt/β-catenin thus couples two different telomeric maintenance pathways that are activation of hTert and maintaining the TRF2 level. In our study we observed similar pattern of occurrence for the β-catenin, hTert, Rap1 and TRF2 group of proteins in human HNSCC cases supported by the protein expression in tumor and the cut margin areas. The western blot data clearly indicates stabilization of β-catenin resulting in stable expression of hTert and TRF2 which are known as its direct transcriptional targets (Figure 1A). The quantified western blot data confirms the observation and shows a similar trend, the cut margin showing stable β-catenin expression indicates infiltration (Figure 1B). To validate the findings, Immunohistochemistry analysis was performed to confirm the expression of β-catenin in the infiltrating regions of tumor sections. 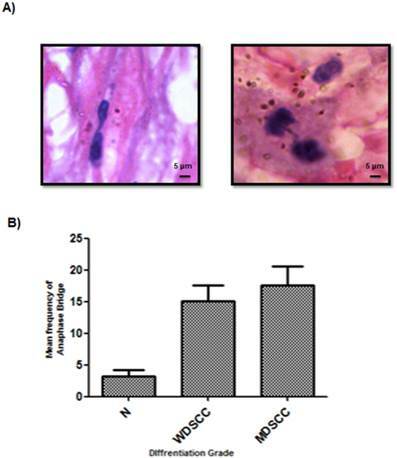 The results showed a distinct membranous along with nuclear expression of β-catenin in the invading front (Figure 1C (II and III)) of the tumor when seen with respect to the normal squamous cell regions (Figure 1C (I)) yet to be invaded. The cases were then categorized according to their histological differentiation grading as WDSCC and MDSCC respectively. To correlate the protein levels of β-catenin along with the shelterin component and their co-expression in a grade specific differentiation phenotype, we performed a comparative immunohistochemistry analysis in different grades of tumor cases as shown in Figure 2. Haematoxylin and eosin stain of both well differentiation and moderately differentiation tissue regions are shown in Figure 2A and 2B. For the dedifferentiation to occur, β-catenin, being a cadherin group of protein, plays a vital role in metastasis which shows translocation from membranous cadherin expression to nuclear transcriptional factor localisation. In the present study β-catenin is showing a stable membranous expression in WDSCC and a nuclear translocation in MDSCC as illustrated in Figure 2C and 2D(inset). TRF2, being the transcriptional target of β-catenin and a shelterin group of protein is also stable in WDSCC and a cytoplasmic translocation is observed in MDSCC regions as seen in Figure 2E and 2F (inset). Rap1, a telomeric protein, is strongly and stably localised in the nucleus both in WDSCC and MDSCC confirming a telomere crisis and need to stabilize the telomere Figure 2G and 2H. With increasing histological grade the extent of DNA Damage is increased with a compromised repair process as a consequence of which the shelterin complex protecting the telomere also disrupts, signalling ATM-dependent DNA Damage sensors leading to genomic instability, a hallmark of tumorigenesis. There was a sharp increase in the genomic instability parameter with increasing histological grade with respect to the frequency of anaphase bridges found in the patient cohort under consideration as shown in Figure 3. The average anaphase bridge was <18% in MDSCC when compared to<13% in WDSCC and <3% in normal cut margin of samples. It correlated well with decrease in Telomere length in moderately differentiated samples <4(arbitrary fluorescent unit) when compared to WDSCC and normal cut margin >7 as can be seen in Figure 4. It has been reported that telomere shortening is associated with aggressiveness, higher histological grade and poor prognosis of several type of cancer. [41, 42] With increasing histological grades, DNA damage is expected to be higher coupled with the loss of telomere length as compared to the lower grades thus indicating genomic instability and dedifferentiation. This accelerated telomere shortening is a hall mark of telomere deregulation and Sheltrin disintegration. Therefore evidence from our study supports the earlier known fact that telomere dysfunction impairs genetic stability and it correlates with the aggressiveness of the tumor. To observe the correlationship of the β-catenin gene expression, 12 cases of different HNSCC grades were randomly selected from the cohort for the real time quantitative PCR analysis Figure 5. A stable β-catenin expression was observed both in the cut margin and their respective tumor tissues in the samples under consideration. There was a net upregulation of the β-catenin expression level in the majority of cut margins samples of the patients and more than 50% of the cases showed considerably high expression in the cut margin areas when compared to the tumor. A significant correlationship was observed in the cases showing a net upregulation in the β-catenin expression level in the cut margin and their respective pathological and clinical prognosis as highlighted in Additional File 1. From the cohort it was also observed that 13 patients out of 67 showed recurrence within 18 months of the onset of the disease. (Additional File 1) Strikingly, all of the recurrence cases had overall stable expression of β-catenin and telomere dysregulation, associated with poor prognosis and finally died. Although less in number but this confirms the infiltration of aggressive β-catenin upregulated cells in the cutmargin area in the patients having poorer pathological and clinical outcomes which results in minimal residual disease and recurrence. In conclusion, β-catenin being the cadherin group of protein and a potent transcription factor plays a vital role in cellular differentiation and metastasis. Our molecular pathological validation study with patient samples has shown that β-catenin might be playing a vital role in regulating two very important pathways that are telomere maintenance and hTERT regulatory pathway and telomere protection shelterin proteins, known to be the hallmarks of tumorigenesis and responsible for the DNA Damage responses generated due to the progression of the carcinogenesis. With dedifferentiation there is a DNA damage microenvironment with an impaired repair process leading to severe genomic instability. Although it needs validation in large cohort of samples we have attempted to link three distinct and important events in molecular carcinogenesis processes such as tumour development, dedifferentiation and genomic instability in HNSCC tissue specimens graded by independent pathologists Figure 6. As the process of tumorigenesis is understood at various levels and expression of molecular markers such as β-catenin, hTERT, TRF2, RAP1 correlates significantly with the process of tumorigenesis, we propose that molecular pathology along with classical WHO grading would be a better diagnostic and prognostic tool for effective management of HNSCC. Schematic representation of the regulatory proteins involved in the process of tumorigenesis and linking three important events such as tumor development, dedifferentiation and genome instability in HNSCC. HNSCC: Head and Neck Squamous Cell Carcinoma; MDSCC: Moderately Differentiated Squamous Cell Carcinoma; WDSCC: well differentiated squamous cell carcinoma; MRD: minimal residual disease; DSB: double stranded breaks. Table showing clinico- pathological details of patients (staging, type of tumor, morbidity CT, RT planning and prognosis). Figure S1: Western blot showing protein expression in the cut margin and tumor samples of the respective four antibodies (β-catenin, TRF2, and hTERT) for 33 cases and β-catenin protein expression in the cut margin and tumor samples for additional 34 cases. Figure S2: Immunohistochemistry images showing protein expression cut margin and tumor samples of the respective antibodies (β-catenin, TRF2) for 33 cases. This work was supported by extramural funding from Department of Biotechnology (DBT), Government of India.